Wine-oh 4 in 1 Wine Opener Multi Tool - Foil Cutter, Corkscrew, Aerator Pour Spout and Bottle Stopper - Multi Use Bar Tool Kit - Wineoh by Oh! Wine! 4 in 1 tool has all the important wine tools you need, foil cutter, corkscrew pull, pour spout and wine stopper all in a single tool, making for less clutter and less digging for the proper tool. Completely pull and discard your cork without ever touching it. Works on real and synthetic corks. 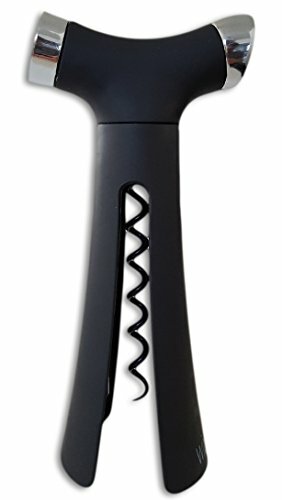 Extra long corkscrew lets you remove even longer corks without having to pull or pry on the opener and therefore not risking breakage of the cork. Discard the cork without ever touching it! Opposite the spout, a wine bottle stopper also comes right out of the handle to help preserve your wine longer in between pourings. The wine-oh 4 in 1 wine tool is an essential. It gives you all you need and it's clever design allows you to remove and discard a cork without ever touching it. Start off by placing the first inside ridge on the top of your bottle, squeeze the wine-oh and spin, the inside cutters safely and quickly release the top of the foil from the bottle. Press the corkscrew into the cork and begin spinning the handle clockwise. Once started, squeeze the wine-oh again and the second inside ridge will catch the lip of the bottle and, as you spin the handle, the cork will become completely removed from the bottle. Once removed, by gripping the wine-oh and spinning the handle counter clockwise you can completely remove the cork without ever touching it. Let it drop right in the trash. Built into either side of the handle are two additional tools; a pour spout to assist with pouring and aeration and bottle stopper to help preserve the wine between pourings. EXTRA long corkscrew worm reduces chances of frustrating cork breakage. Just start the corkscrew and spin as the inner ridge catches. Cork will come completely out without ever having to pull on it. INCLUDED pour spout and wine bottle stopper are stored in either side of the handle. Avoid having 4 separate tools! BUILT in, precision foil cutter is part of main unit; no need for a second, separate tool. Just grasp it around the foil and spin the bottle. Foil comes off easily. If you have any questions about this product by Wine-oh, contact us by completing and submitting the form below. If you are looking for a specif part number, please include it with your message. Limited Sale. VinousQ Premium Wing Corkscrew, All-in-one Luxury Wine & Beer Bottle Opener For Easy Cork Removal, Packaged in Ready to Wrap Gift Box. Risk Free. Enhance your Fine Dining Experience Now!